Where did October go? More importantly, where did September and October go? I have been so much busier than usual this semester and time is flying by. 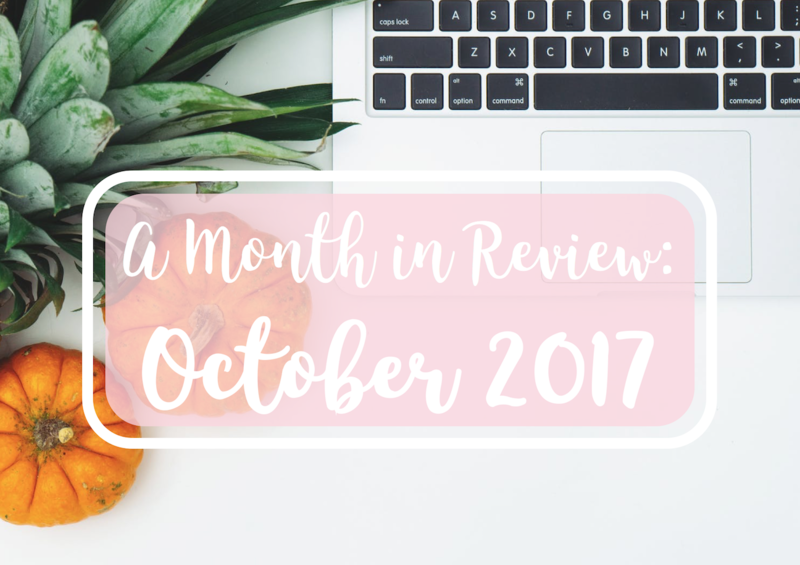 I didn’t accomplish a lot of my blogging and Etsy goals for October, which is really hard for me to admit, as someone that’s a little too ambitious and extremely goal driven. If you read my last post, you learned a little insight of just a few of the crazy things that happened to me this October. One of the major “losses” for me this month was not finding the time to write and create like I’ve had pretty much every month since I started this blog, which was really hard for me to deal with. Because of that, I didn’t get as much content up as I’d like and when I sat down to craft my next post, I realized there’s a lot to be said from October in my real life, so I wanted to share that with you all. I’d like to start including more lifestyle posts like this one on my blog, if I can come up with a catchier title for monthly review posts! To put it nicely, October threw me a lot of curveballs and gave me just about as many things as I could possibly handle at once. I had a lot of non-negotiable things demand my attention and try to steal my joy. Honestly, I was just very unhappy and stressed for most of the month. To start, October’s schedule was already one of my busiest in terms of commitments, as this month included our Big Little week and Initiation for Gamma Phi Beta. I became a big this year, which meant I gave a week’s worth of presents to my adorable little, before finally getting to reveal who I was to her and celebrating officially being big and little! I had such a fun time crafting and shopping for my little, Savanna, as we have super similar tastes in everything. She wasn’t surprised at all that I was her big, but it was still a fun week to get to spoil her. You’ve probably already heard by now, but I opened my own Etsy store ! Early October was the busiest for the store, with lots of orders for both Big Little and Initiation gifts. I lovelovelove having this store and all that comes with it, but Big Little week was definitely a challenge to complete all my orders and my own gifts. Contrasting the super-busy-and-successful first two weeks, the second two weeks of October were my worst weeks yet for the store, which was also hard for me to swallow. However, the lack of recent orders turned out to be a blessing because it was one less thing to worry about when everything else got crazy for me. In my terrible-but-also-kind-of-great week that I wrote about in my last post, I was also elected to my sorority’s executive board, as our next Vice President of Panhellenic Affairs. I was not expecting to win the election, but I’m so thankful that my sisters saw something in me and elected me to this position. As VP of Panhellenic Affairs, I’ll be serving my chapter as an executive member, as well as serving as our Panhellenic delegate, making me the liaison between my chapter and the rest of the Panhellenic community. I won’t be officially installed in the position for another week, but I already jumped into the position full-force. My PAVP obligations ate up a lot of my extra time, but I plan to budget my time better next month so I won’t feel as overwhelmed. This was a big issue for me this month. I talked about this in my Instagram story yesterday, but I’m enrolled in 16 credit hours this semester. I also have a research assistantship through the honors program, this blog, my Etsy store, and all my sorority obligations, on top of life in general. It’s a lot, even for me. This is my second year of college, but I’ll be graduating next December, which means all my college experiences are compressed. Often, it feels like I’m going running through college while everyone else is strolling. I didn’t have as much time to write and create as I would’ve liked this month, which helped me appreciate how important this blog truly is to me. I’m in the process of setting some new goals and planning ahead for my content and photos. I’d love to do my first Q&A post, so if you’d like to leave me a question to answer, please ask away here. Life really gave me a run for my money this month, and my college classes did, too. I had midterms, essays, and a bunch of tests and quizzes and assignments and projects and you-name-it’s this month, and the combination of them all was a huge challenge. But because of my accelerated graduation schedule, this semester is basically like my whole junior year rolled into a few months. I did not feel successful at all at managing my time among all my classes, but I did the absolute best I could and managed to earn all A’s (and one high B) on my mid-terms, so that was a much needed win. This is a big win this month! This month I made a new blogging friend who goes to FSU. She actually had her own successful Etsy store and is just beginning her blog, so it was really fun to meet with her a few times this month and help each other word towards our blogging and Etsy goals. In October, I also did a collaboration with Hopes.com on my Instagram, and they featured my post on their page, which was so fun and special for me, since I haven’t done too many brand collabs yet. I also began a collaboration with another company for a post that’ll go up soon. Securing this next collab was a big win for me, and I’m so excited for you all to see the post! Looking back at October is bittersweet because even just looking at the positives, I can’t help but remember all the long nights, frustration, and not-very-nice-things that came with the wins. Looking forward, I have some new ideas and directions I’d like to take this blog and my Instagram, and I have high hopes for November already. Thanks for your support, and for sticking with me through this post! College is an absolutely crazy time, but I am learning and growing so much, and for that, I am incredibly thankful.